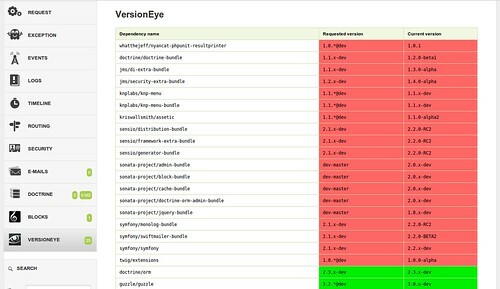 The VersionEyeBundle for Symfony2 tracks all dependencies in a Symfony2 project by posting the project's composer.json to the VersionEye API. The results are conveniently displayed in the Web Debug Toolbar and on the Profiler page. It's meant for the dev environment only, of course! The Profiler page gives you detailed information about all the dependencies in your project. This is only the first, early version of the Bundle and has been used only by me so far. I would very much appreciate it if you try it out and report any issues (even better: Pull Request with failing test) or give me feedback. I hope you like it!